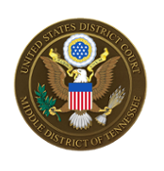 The US District Court for the Middle District of Tennessee has a robust alternative dispute resolution program. Sometimes our judges may refer your case for mediation services. Please see the other links on this page for information on our court approved mediators. If you would like to become a court approved mediator, and meet all requirements, please submit the ADR neutral form through the links to the left.